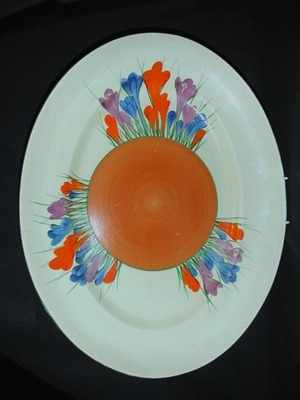 Quite the largest Clarice Cliff Crocus plate that I have ever seen. A massive 16.5 inches long. Overall good condition. A bit of paint loss to the purple and a very tight 1 inch hairline on the rim. Date stamped for July 1932. Signed "Bizarre by Clarice Cliff".